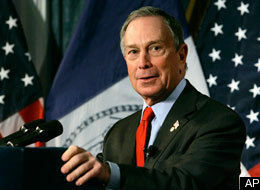 Bloomerg became NYC’s richest person by serving the Wall Street banks, “the financial sector.” He ignores the smaller financial institutions, which don’t bring income to his business, but he says (though only by implication, not by direct assertion) that Hillary Clinton’s rhetorical turn to the left is in violation of her husband’s time in office, when Bill Clinton deregulated Wall Street and so prepared the way for George W. Bush’s economic crash — which Bloomberg has always said wasn’t Wall Street’s fault. He doesn’t say that the election of Hillary Clinton “is not a risk I can take in good conscience,” but just that his being a candidate would deprive Hillary Clinton of the Presidency, and that that’s “not a risk I can take in good conscience.” So: he clearly prefers Clinton, despite his saying that, « The leading Democratic candidates have attacked policies that spurred growth and opportunity under President Bill Clinton.” He seems to be implying that Hillary Clinton’s recent rhetorical turn to the left is only in order to win the Democratic nomination — not a real indication of the way she would govern as President. Bloomberg’s statement makes clear his great admiration for Bill Clinton and Ronald Reagan — two very pro-Wall-Street Presidents, supporters of “the financial sector” that he obviously cares about very much. He says: « The fact is, even if I were to receive the most popular votes and the most electoral votes, victory would be highly unlikely, because most members of Congress would vote for their party’s nominee. Party loyalists in Congress — not the American people or the Electoral College — would determine the next president,” which would be the Republican nominee, because Republicans have majorities in both houses. That clearly states Bloomberg’s having turned the more against running when Sanders’s crushing 74% loss to Clinton in South Carolina indicated, to Bloomberg, that Sanders wouldn’t be the Democrtic nominee — Clinton would. According to this line of thinking, Bloomberg might have entered the contest if Sanders were to be the nominee, but he no longer thinks that that possibility is credible enough for Bloomberg to enter the contest early enough to be able to get onto all the states’ ballots. He’s got to decide right now, and so he did. Perhaps he will be donating to Clinton’s campaign now.